Few ski-in, ski-out locations offer "ski to the back-door access" which is why this unique four bedroom residence is named Snowline Ridge. You can ski to and from your own door or deck onto the ski trails. It's a fabulous retreat for the family who wants the ultimate in convenience and quality. 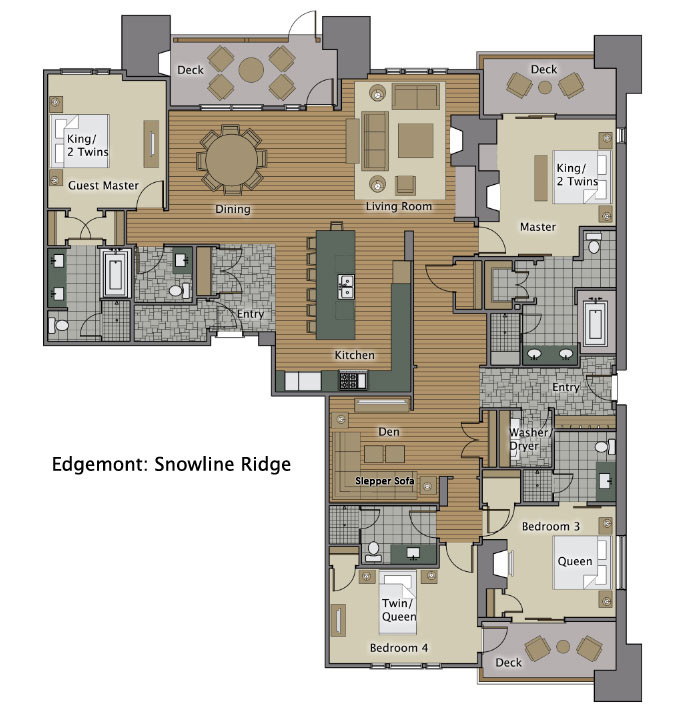 With private access to the Steamboat ski trails, Snowline Ridge takes convenience to the highest level. This spacious slope side four bedroom residence offers great sunset views towards the Sleeping Giant and less than a stones throw view of the ski trail action. The tasteful furnishings complement the magnificent architecture of Edgemont. Classic, mountain home touches include a native Colorado sandstone fireplace which provides a central focus for gathering to enjoy tales of a day on the mountain. The professional grade kitchen is fully equipped for entertaining and includes a 6-burner Viking Range and GE Monogram appliances and a Nespresso coffee machine. There is seating for 10 at the dining room table and an additional 4 at the kitchen bar so entertaining with guests is a temptation you can indulge. With two master bedrooms offering the option of configuration as a King bed or as two twin beds, this home can accommodate many guests as needed. Like the two master bedrooms, the Queen bedroom has a private en suite bathroom. The bunkroom with Twin over Queen set up works for either a couple or for up to three children and an additional couple or two children can utilize the queen sleeper in the media room. When not relaxing in your spacious home, enjoy one of Edgemont's community amenities; such as: the heated outdoor pool and hot tub, enjoy a conversation over s'mores and hot chocolate by the outdoor fire pit, or relax indoor next to the gas fireplace in the lounge. In addition to your own in-house ski storage, you can also take advantage of the community ski locker room next to the slopes. There is exercise equipment onsite to keep your fitness regime on track. Moving Mountain is the best. I thought I was just booking a condo and then Jenny from Moving Mountains asked me what we wanted to do...next thing I know she had an entire itinerary for us catered to the ages in our group......she even assisted once we hit the ground as plans changed.....our Condo was fantastic and top notch....especially the whole condo music and tv system...music never stopped. Summer in Steamboat.....awesome! The home was very nice and spacious. Had we had older children the location would of been perfect, but because we have young children it made the mornings to ski school and evenings not as convenient. Not the homes fault just wasn't located exactly as close to the base of the mountain as I thought when I rented and our family would of preferred being at the base. Edgemont has now set the new benchmark for holiday accommodation.The apartment was exceptional, the location unbeatable and the staff were amazing.Do not go anywhere else in Steamboat...or should I be keeping this secret to myself? The condo n the soaps was fantastic and the service from Moving Mountains was above expectations. The Edgemont is the most convenient ski in / ski out we have ever been in and this particular unit was beautiful with all the best amenities.